The world is your runway – every day you choose the outfits that will make you stand out from the crowd. You are the model, the stylist, and the designer all in one. However, in life, like in any fashion show, there could be an unexpected turn of events. Don’t let a little drizzle or a big storm ruin your designer wear – protect your style and add some extra flare with La Bella Umbrella. Forget that dollar store umbrella that you want to hide away the moment you get inside; these beautiful rain accessories are a work of art that will compliment any outfit. Choose the design that fits your lifestyle from 40 different options! Let these gorgeous designs be the inspiration to your daily fashion ensembles. Every fashionista must stock up the closet on floral prints for the spring and summer. It is a classic pattern that will be coming back for years to come. 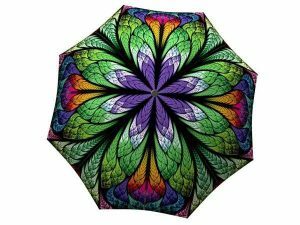 If you are going to invest in an umbrella that will serve you for a long time, this is the perfect print that will not become boring or go out of style. 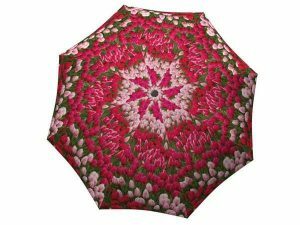 The vibrant flowers on the Tulip umbrella are also a great way to add a pop of colour to neutral coloured trench coats or any other rain jacket. Van Gogh’s Starry Night is a unique design that will be an amazing addition to any style enthusiast’s closet. This designer umbrella is sure to make an impression on anyone who sees this beautiful canopy. The durable fabric is sure to make it through many years of rainstorms, making the owner of this special umbrella a true fashionista. 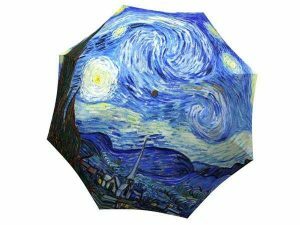 This umbrella has an aesthetic value to it that every creative person will appreciate. If you are ever worried about matching anyone at work, you can put your anxiety to rest with this beautiful and unique umbrella. You might have picked out the perfect outfit and a gorgeous pair of shoes, but don’t forget the cherry on the cake. Every fashionista knows the importance of accessorizing. Don’t think that it’s just the jewellery that brings the outfit together, umbrellas can also make a great statement piece to any ensemble. 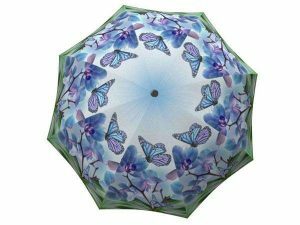 This beautiful Butterfly umbrella is a great option with stylish spring pastel colours. The delicate design won’t overpower your unique look, but will add a touch of flare to your gorgeous style. 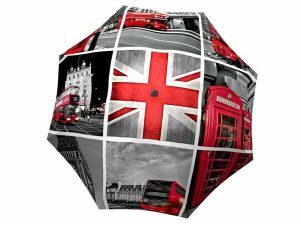 The London umbrella is definitely a timeless design when it comes to patterns and prints. Everyone can recognize the signature red colour of the double decker and the telephone booth, which makes this the accessory that is sure to put you in the spotlight. The classic white, black, and red pattern will match any outfit, while giving you that pop of colour that every stylish outfit needs in order to stand out. The beautiful stick umbrella adds an extra level of elegance if you decide to channel the timeless style of the royal family while being inspired by rainy London. 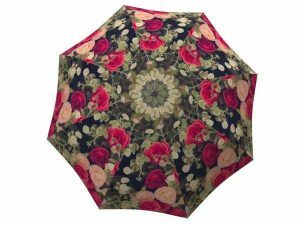 The Vintage Roses umbrella is a must have for all the trendy fashionistas who are looking to add a touch of retro glam to their wardrobe. This special rain gear is channeling the classic floral pattern that can be seen on anything from dresses to jackets. Floral never goes out of style; it is a timeless print that looks beautiful on anyone. The vibrant colours of the fabric are sure to compliment any unique rainy-day ensemble. Don’t forget to stay out of the sun as well – this beautiful designer umbrella can also function as a parasol. Milan might be the fashion capital of the world, but it’s not the only city in Italy that should be getting every style diva’s attention. The unique Venice umbrella is an amazing addition to any outfit whether rain or shine. The vivacious colours will make you the belle of the ball as you stroll in the rain while keeping your outfit intact. Fashionistas might be tempted to opt in for everything Italian made, but this Canadian designed umbrella definitely hits the mark. The unique print of this rain accessory looks expensive and luxurious, which will add class to any designer ensemble. Be inspired by this gorgeous umbrella and let out your inner Coco Chanel. Parisian style is known for being chic, and this Paris stick umbrella is sure to complete any French girl outfit with its sleek design and timeless look. Don’t be afraid to be bold and start making long-lasting impressions on people by having a signature accessory or detail about your outfit. Mesmerizing others with your fashion sense is easy when you have such designer gear on hand every time you go outside. Every fashionista wants the world to be captured by their unique fashion picks and stylish ensembles. However, your personal style should never become the victim of the weather. 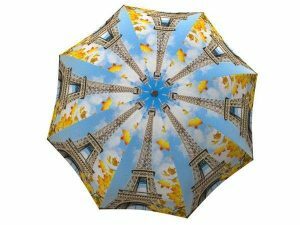 With La Bella Umbrella, it is easy to keep your fashionable outfits intact with forty different designs to choose from. Remember that it is possible to stay dry in style. 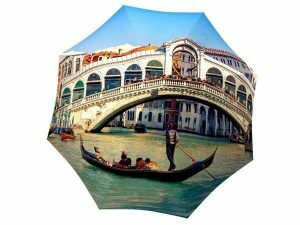 Previous Post Unique Gifts For All Occasions – Beautiful Art Rain Umbrellas Next Post Is a Canadian Windproof Umbrella a Myth?